The Storm Cellar is a room inside the Old Clockworks in Luigi's Mansion: Dark Moon. The Storm Cellar is accessed by taking the secret entrance in the south area of the Clockworks Court. The Storm Cellar is a small room located underground. The area is covered in sand and has various equipment including wheelbarrows and barrels. There is a pulley-operated gate blocking the door. A bed and a couple of shelves with containers are on the west side of this room. The door to the north leads into the Canyon Hall. It is impossible to get back above ground in this room. 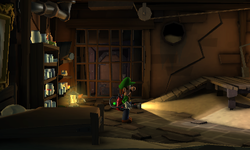 During C-2: Underground Expedition, Luigi needs to travel to the Storm Cellar to reach the underground portion of the factory. When Luigi drops in, he needs to defeat two Greenies hiding in this room. One of these Greenies hold a rock Luigi is able to pick up using the Poltergust 5000. Using this rock, Luigi can weigh down the lift so the gate rises, allowing Luigi to enter the door. Starting on C-2: Underground Expedition and most missions after, Luigi can pull away the wallpaper above the bed. This reveals a portrait of a ruby that can be shined by the Dark-Light Device. This page was last edited on May 1, 2017, at 21:16.